Great writers are often measured by reviewers using a literary yardstick of sorts. In “The Art of Dramatic Writing,” Lajos Egri applies a mathematical formula to dramatic structure. He contends that the degree to which the reader cares about the main character and the depth of the danger he endures is in exact proportion to the readers’ satisfaction at the end of the story. In Deliberate Deception, skilled storyteller Joe Porrazzo executes this formula to perfection. 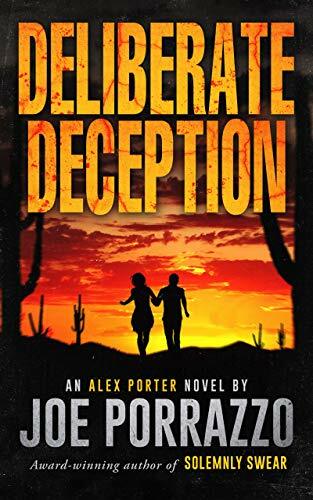 To deal with the first element of the equation, the reader instantly sympathizes with Alex Porter, who’s just moved to Tucson and opened a P.I. office. His first assignment, to test the security systems of Doolittle-Mitchell Air Force Base, is successful, partly due to his experience as a retired Air Force OSI Colonel. Porter’s painful background, the loss of his wife and daughter, add greatly to his appeal. The P.I. is quickly pulled into a complex plot involving six murders, all occurring within a week’s time. The deeper Alex digs into these murders, the more threats to his life multiply. What follows with lighting speed and mind-boggling plot twists is a masterfully told drama of fascinating intrigue, deceptive characters who are seldom who they seem to be, and a ‘What the hell is gonna happen next!’ thrust that keeps the reader on edge waiting anxiously for the next unexpected and surprising slam in the gut. Porrazzo, a retired U. S. Air Force officer still employed at the Department of Defense, expertly weaves his knowledge and experience of covert operations, as well as a full familiarity of police work, into a fascinating complexity of danger and a spellbinding panorama of action, surprise, and dramatic tension. The story shifts effortlessly from Tucson to Trinidad to D.C. We were particularly hooked by Porrazzo’s military expertise, his sense of drama, and his ability to combine Air Force protocol with interesting characters who always kept tricking us with their false facades. His descriptions of locales, scenery, and neighborhood angst were compelling. We could smell the decay and poverty of the Tunapuna District of Trinidad where Porter goes to meet Ronnie Brown, a minor but interesting player. Finally, the dialogue moves quickly and reveals character. And referring back to the formula for a great work of fiction, the writer masterfully fulfills the first piece of the mathematical equation by making us care deeply for Alex through the trials he endures…leading us to the second part by providing a satisfying ending to the drama. The final equation: Deliberate Deception = Five-Plus Stars.